The success of an articular cartilage repair is dependent upon patient compliance during the rehabilitation process and the protocol is based on restricted cartilage load combined with gradual increase in activity. Many rehabilitation protocols suggest partial weight-bearing as the standard of care for successful outcomes. However, patient compliance to partial weight-bearing instructions with crutches has been shown to be inconsistent. The Rebound Cartilage is a protective functional solution designed to support regeneration of the knee cartilage after repair procedures such as Microfracture, OATS and (M)ACI. 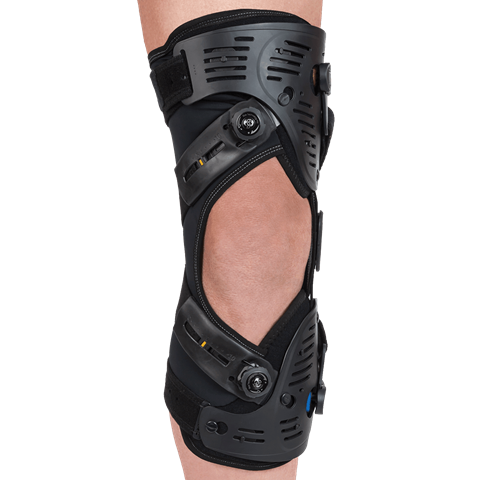 Based on the clinically-proven 3-Points of Leverage System and patented Cartilage Protection Straps,™ joint unloading is maintained in flexion for protection of the cartilage during the healing process. Articular cartilage defect repair needing unicompartmental load reduction or range of movement restriction. Cartilage knee trauma benefiting from unloading or movement restriction and needing pain relief.